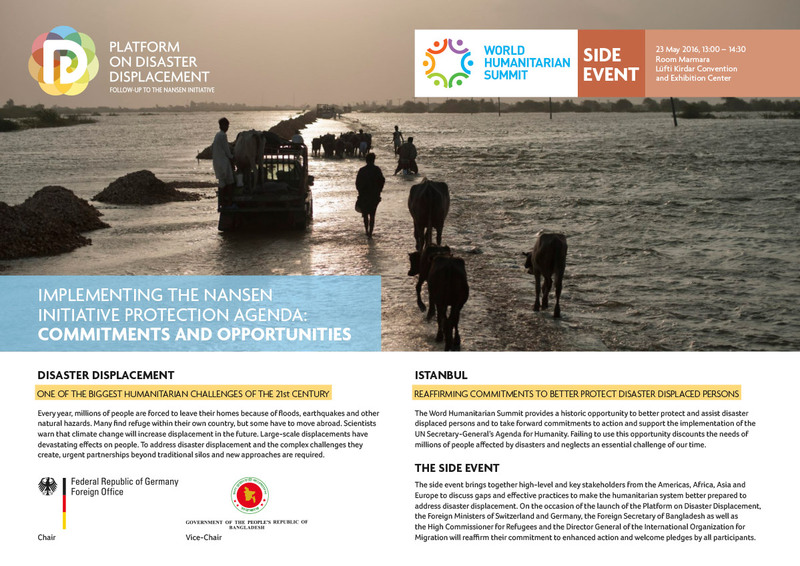 This side event will promote follow-up to the Nansen Initiative and the implementation of the Nansen Initiative Agenda for the Protection of Cross-Border Displaced Persons in the Context of Disasters and Climate Change (Protection Agenda) by launching the new Platform on Disaster Displacement, which will start to work on 1 July 2016 and replace the Nansen Initiative. Like its predecessor the Nansen Initiative, co-chaired by Switzerland and Norway, the Platform on Disaster Displacement will be a state-led process, with Germany assuming Chairmanship on 01 July 2016, supported by Bangladesh as Vice-Chair. The side event will also include a high-level panel seeking to explore ways to strengthen and broaden commitments to reduce and address disaster displacements and prepare for cross-border disaster-displacement. Expected outcomes from the side event are: 1) discussion of gaps, 2) identification of effective practises and 3) formulation of commitments to action that can make the humanitarian system better prepared to plan for and respond to disaster displacement, make vulnerable populations and communities more resilient to disaster and displacement risks, and to prevent displacement when possible. The side event will be co-organized by the Governments of Switzerland and Germany. It will include participation by the Governments of Bangladesh, Costa Rica, Fiji and the Philippines, the United Nations Office for the Coordination of Humanitarian Affairs (UN OCHA) Pacific Regional Office, the United Nations High Commissioner for Refugees (UNHCR), the International Organisation for Migration (IOM), the Pacific Conference of Churches (PCC), and the Norwegian Refugee Council (NRC). 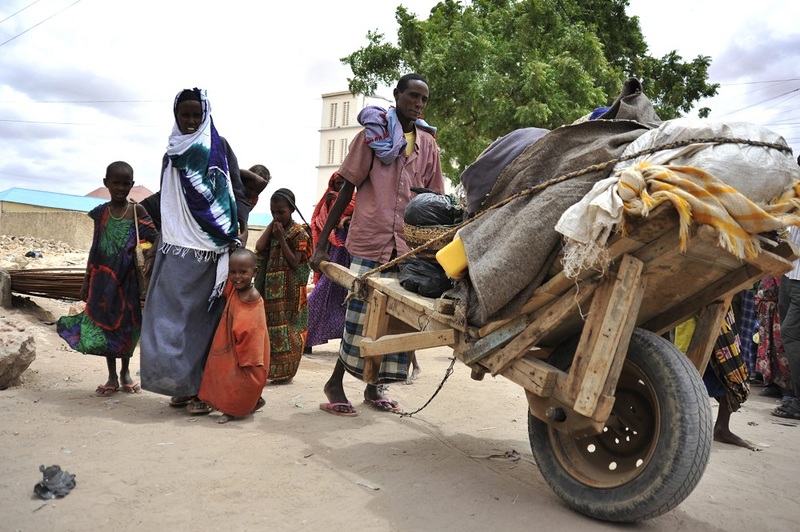 Forced displacement related to disasters, including the adverse effects of climate change (disaster displacement), is among the biggest global challenges facing States and the humanitarian system in the 21st century. Every year, millions of people are displaced by disasters caused by natural hazards such as floods, tropical storms, earthquakes, landslides, droughts, salt water intrusion, glacial melting, glacial lake outburst floods, and melting permafrost. Others have to move because of the effects of sea level rise, desertification or environmental degradation. Looking to the future, there is high agreement among scientists that disasters are expected to become more frequent and more severe. Climate change, in combination with other factors, is projected to contribute to increased displacement. A similar projection is echoed in the Secretary-General’s Report to the World Humanitarian Summit, where he expresses concern that climate change exacerbates other risk factors such as food security and water scarcity, and that disasters are becoming more frequent and intense. The Secretary-General also notes the specific disaster and displacement risks faced by people living in areas such as small low-lying islands, coastal or delta areas, high mountain areas or areas exposed to desertification. He recognizes the special support such situations require. For example, the adverse impacts of climate change are increasingly being felt in low-lying Pacific islands that are vulnerable to sea level rise and extreme weather events. The situation in the Pacific is not unique. People are already being displaced by sudden-onset disasters triggered by earthquakes, tropical storms, and hurricanes etc. or have to move from highly environmentally fragile areas in the Americas, Africa, Asia and Europe. But national, regional and international responses to such disaster displacements are increasingly unable to address and anticipate the scale and complexity of present disasters, leaving affected and displaced populations with inadequate protection. To paraphrase a point made by the Secretary-General in his report, the humanitarian system and others ‘can and must do better’ to reduce risks and vulnerability, and strengthen the capacity to address disaster displacement. The side event aims to promote the implementation of the Nansen Initiative Protection Agenda, and will mark the launch of the new Platform on Disaster Displacement which will be formally established on 01 July 2016 to follow up on the work started by the Nansen Initiative. The side event also seeks to directly support the overall goals of the World Humanitarian Summit. It addresses the desire expressed in the SG’s report for actors across different policy areas to be working more closely together, including humanitarian, development and climate change adaptation actors. It relates directly to at least two of the thematic areas reflected in the proposed high level round tables (displacement and natural disasters) and addresses in particular the objectives related to Core Responsibility Three to ‘Leave no one behind’. 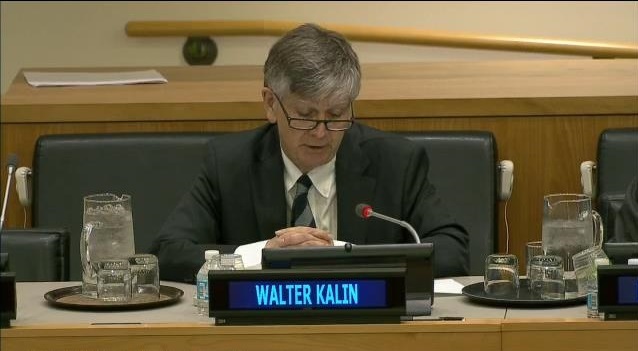 It finally responds to the SG’s call in his Agenda for Humanity to better prepare for cross-border displacement due to disasters and climate change by promoting to put in place national legislation and institutional and operational measures to better protect cross-border disaster-displaced persons. 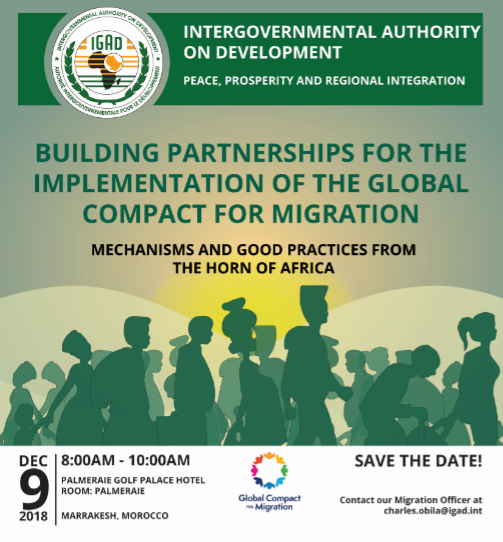 The multi-stakeholder side event will be an opportunity to pledge commitment to concrete action by States and other key stakeholders to reduce and address displacement, and contribute to the outcomes of the goals of the WHS and the SG’s Agenda for Humanity.